Kelsea at Teacher Gems is having a HUGE Teaching Resources GIVEAWAY at her blog, Teacher Gems. The Giveaway runs from January 31- February 4. You can enter the K-2, 3-5, and / or 6-8 and the clipart giveaways! My donation is my Valentine's Day Love Bug Addition with Doubles Activity which comes in color and grayscale. Just click on the picture directly above to learn more about my product. Just click on the top picture to go to Kelsea's Giveaway! In today's post, I'm adding some additional links to fun ideas, activities, resources, book suggestions and online game suggestions to help in your teaching of simple and compound machines. Just click on the links below to go to my earlier posts. I hope you got to see yesterday's post on Simple and Compound Machines. If not just click here. Today's post includes a list of ideas, examples, and activities that you can choose from to do some fun exploring and hand-on activities with your students as you teach and they explore, investigate, and learn about the 6 types of simple machines. Just click on the appropriate link below to go to each resource. Wheel and Axle - What are Gears? Lever - What is a Lever? Are you teaching or planning to teach about Simple and Compound Machines to your students? Here are some resources that are already here on my blog to help you get started or to supplement your teaching. Included are an idea for a field trip, using a store flyer, a word search, a crossword puzzle, and a Venn Diagram. Just click on the appropriate link below to find each resource. Football Frenzy Time is here! Which teams will be competing in the Super Bowl? Use your students' enthusiasm to make some fun paper plate clocks to practice their telling time skills. Lots of stores have paper plates with a football theme on the shelves now. 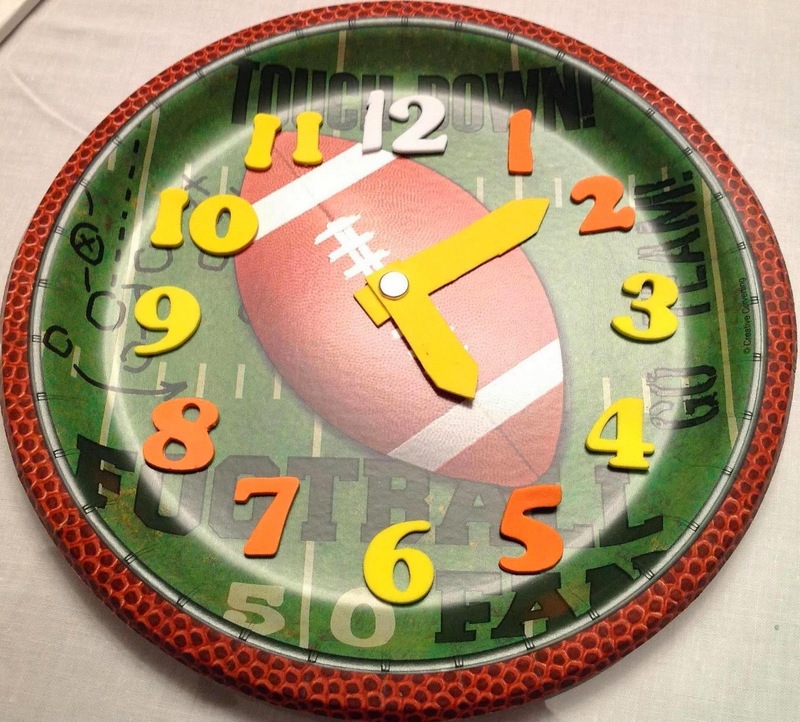 Buy some to use for Super Bowl Sunday and use the extras to make fun paper plate clocks. It would be best for the adults to make the clock hands from the craft foam and attach the hands to the plate with a brass fastener. Let the kids have fun placing the numbers in the correct spots. To get some ideas for other paper plate clocks that you can make or purchase inexpensively as well as some great ideas and resources to help you teach about time just click on the link below. Melissa at Teacher Treasure Hunter is having a HUGE GIVEAWAY!!!! It's the biggest giveaway I have ever seen. She has soooooo many great teaching products and wonderful clip art to giveaway! This is one giveaway not to miss! Just click on the picture above to see my product and click on the top picture to go to Melissa's blog.